I’ve never been to a steak house for Restaurant Week, and have never dined at Capital Grill in general, so was really looking forward to this meal. Hitting up a steak house – or any fine-dining, high-priced restaurant – is my new game plan for Boston’s Restaurant Week, as this is the best way to get your bang for the ($38.13) buck. Capital Grill‘s Restaurant Week menu has a few options per course, and offers its steak house classics. While the salmon did sound excellent I couldn’t not have steak during my first Capital Grill experience. 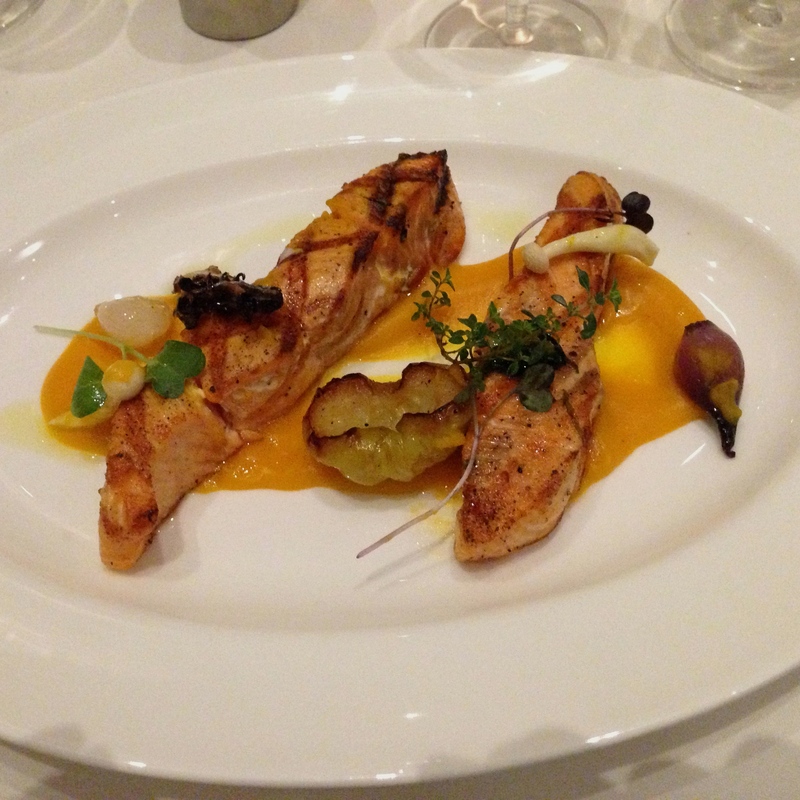 Below is the Summer 2013 Restaurant Week menu and the dishes I chose. 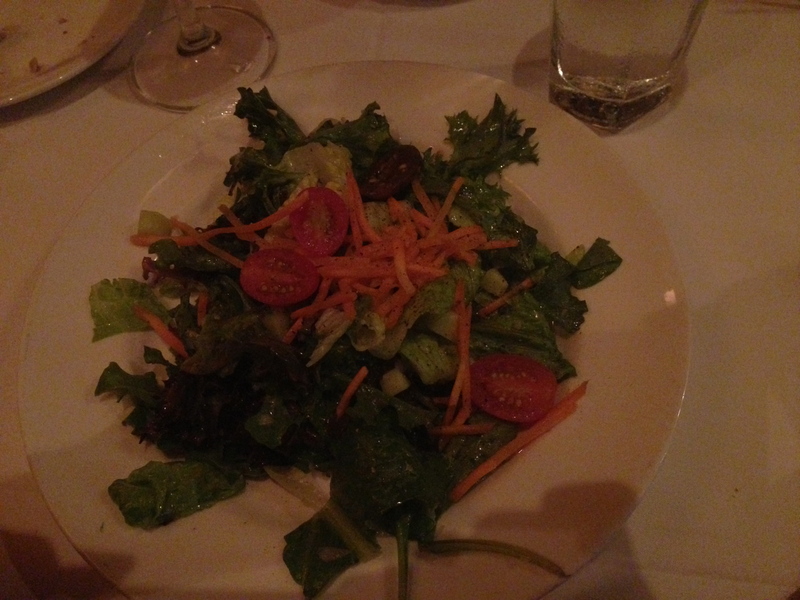 This salad was simple, light and delicious. 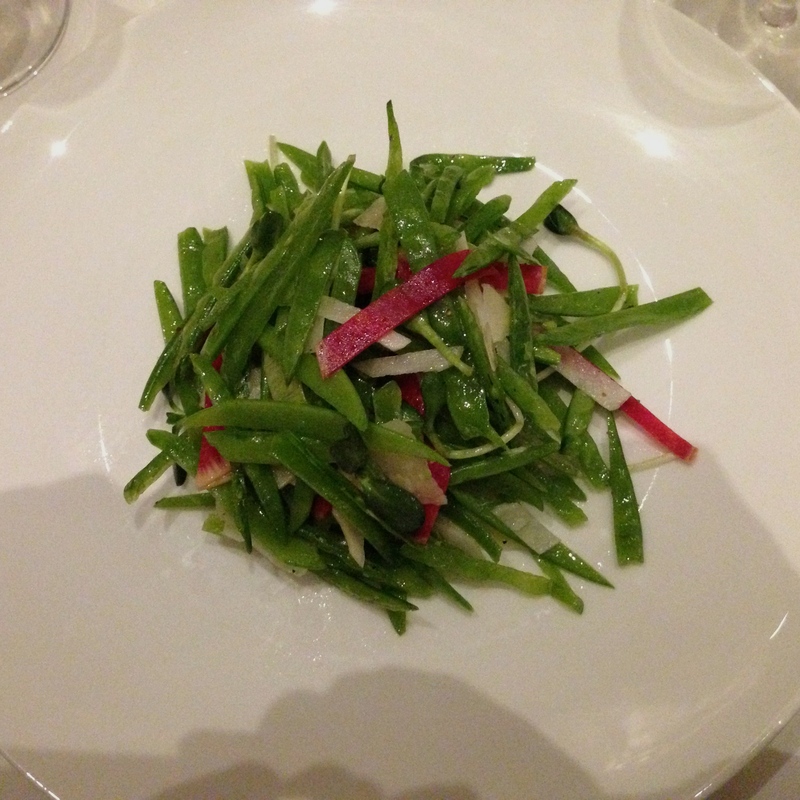 The greens were perfectly dressed with the shallot champagne vinaigrette. The dish really only consisted of greens, carrots, and tomatoes, but it left an impact! I’d order this again in a heartbeat. At non-steak houses I always order steak medium rare and they typically come out looking more like medium. 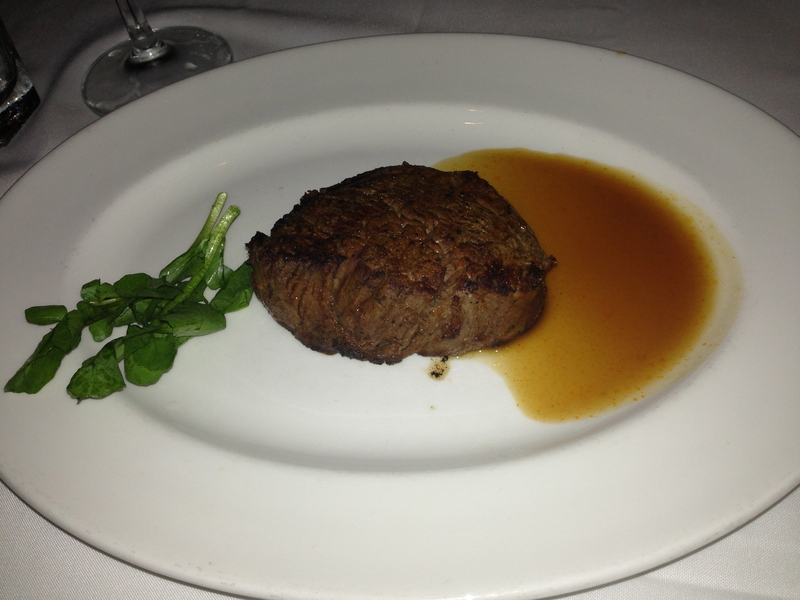 Here I ordered my filet medium, knowing that it would come out perfectly pink and juicy on the inside, which it did. My friend ordered her filet medium rare and she got just that, with the inside of the steak mainly pink with areas of rare red meat. The filet was not only cooked perfectly but was well seasoned and better than I expected. 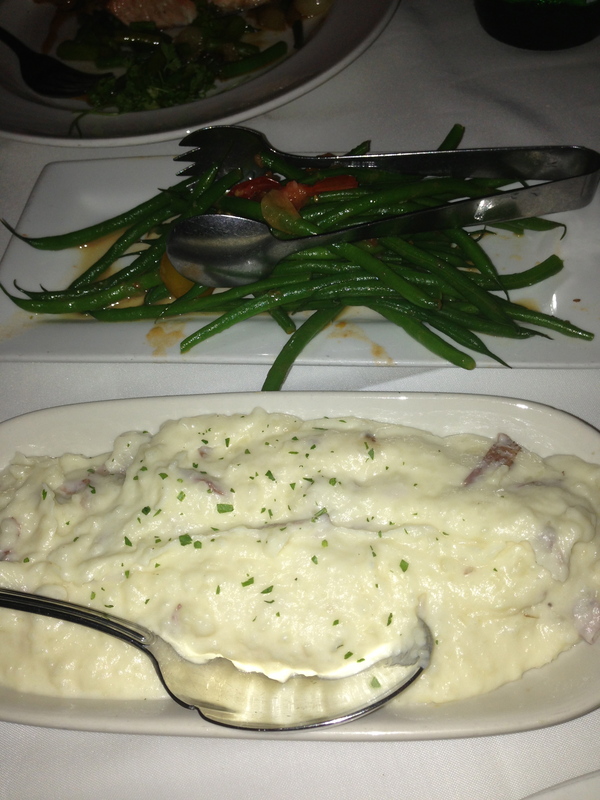 Capital Grill offers a choice of 2 sides to accompany your main course: Sam’s Mashed Potatoes, and French Green Beans with Shallots and Heirloom Tomatoes. 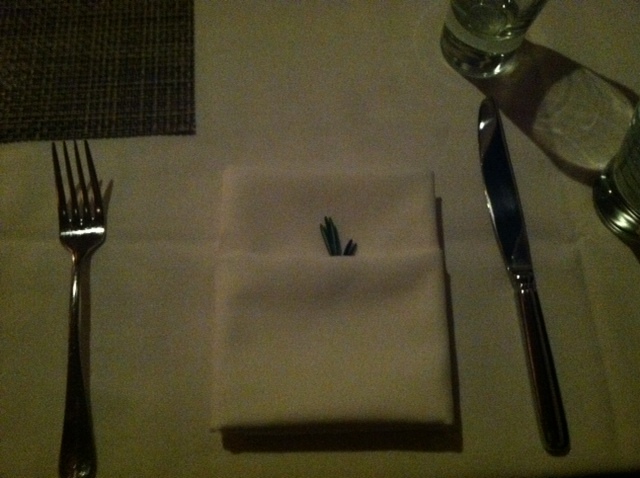 I was intending on ordering the green beans but the waiter said he’d bring us a side of each for the table to share. Can’t argue there! I’m glad I had a chance to taste the mashed potatoes because they were excellent; smooth and creamy with a few chunks of potato skin in the mix. This was kind of a no brainier for me. I don’t frequent steak houses often but hear they typically make a mean chocolate cake. 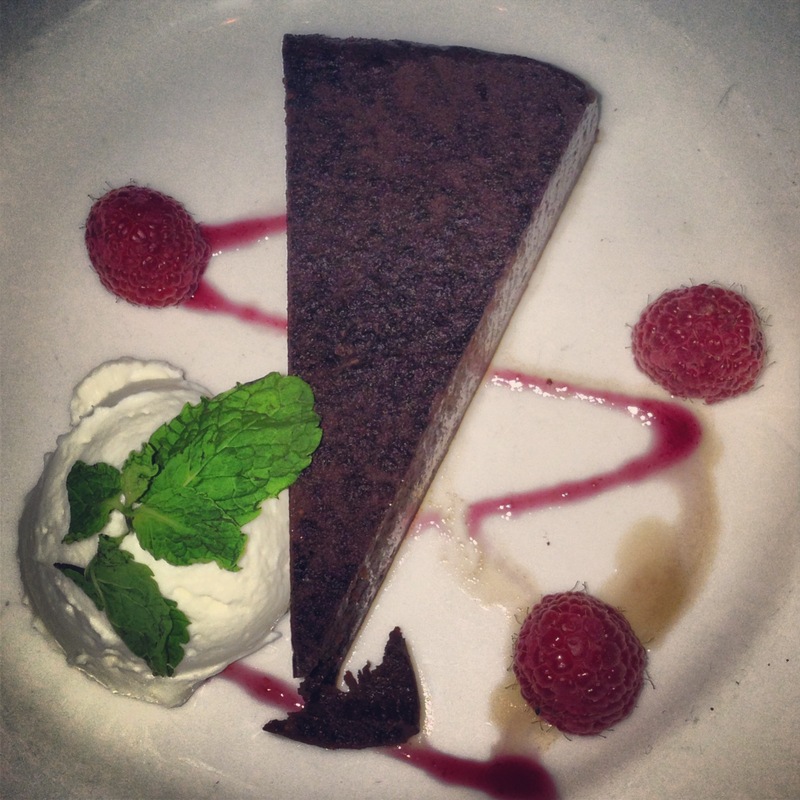 The flourless chocolate espresso cake was dense, and smooth like fudge. Paired well with the whipped cream and raspberries. I have to also mention the bread basket. The dark brown pumpernickel-looking slices were incredible, warm and soft with a few specks of raisins. I didn’t try the rolls but the cracker bread was also top notch. 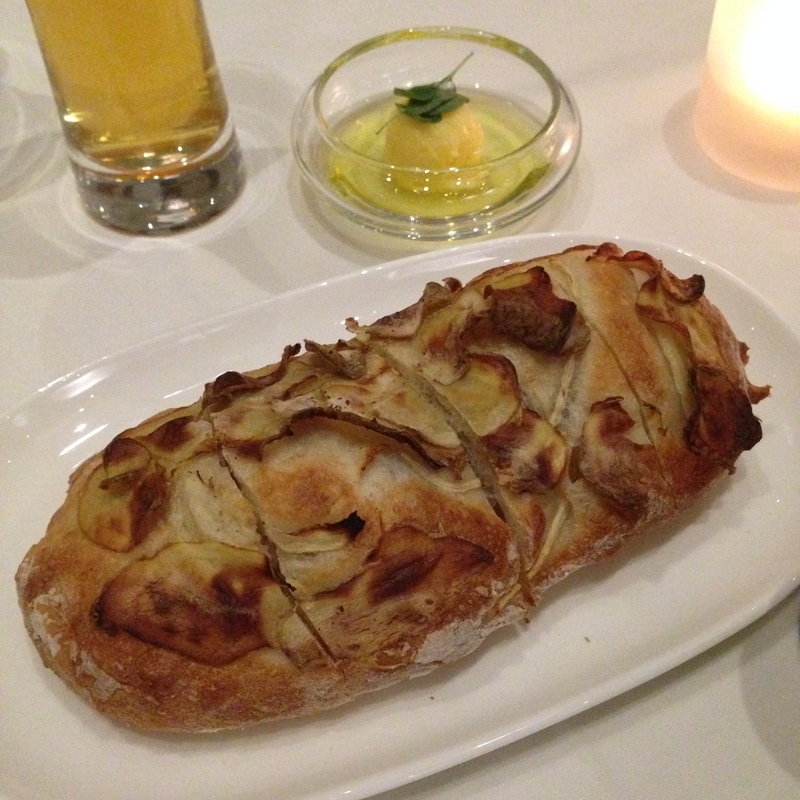 The bread was served with softened salted butter. 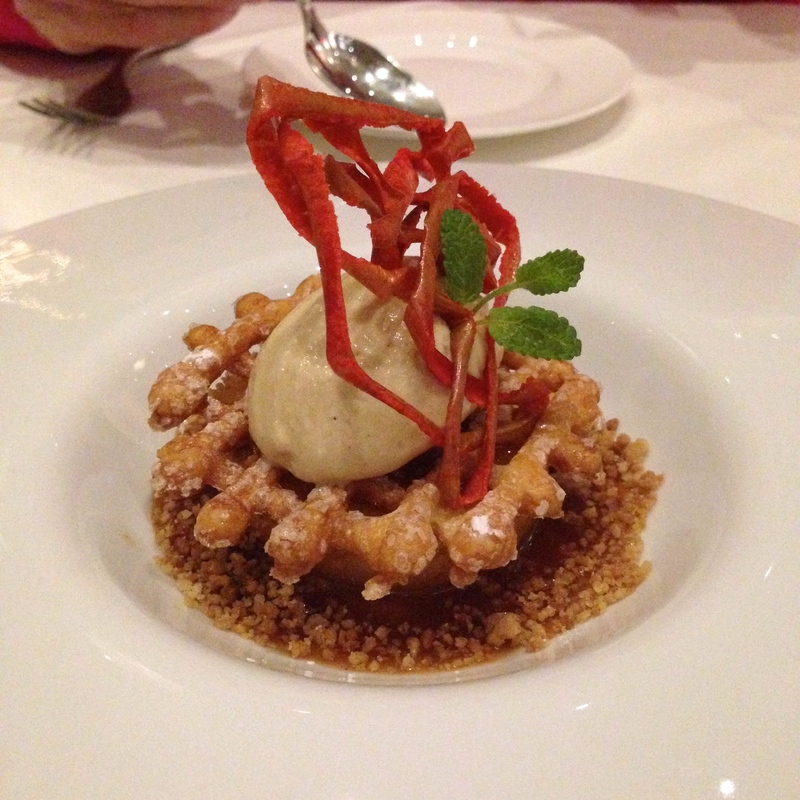 This was my only Restaurant Week reservation this season but I was 1 for 1, with a successful meal at Capital Grill! I didn’t inspect the regular menu but would highly suggest heading here for Restaurant Week. Bread: No bread was served. Menu: Well rounded offerings of contemporary American cuisine: Starters, Big Salads, Pizzas, Sandwiches, Burgers, Entrees, Plate du Jour, Sides. Each section has plenty to choose from and the prices are quite reasonable, with the most expensive item being the Scallop entrée at $26. 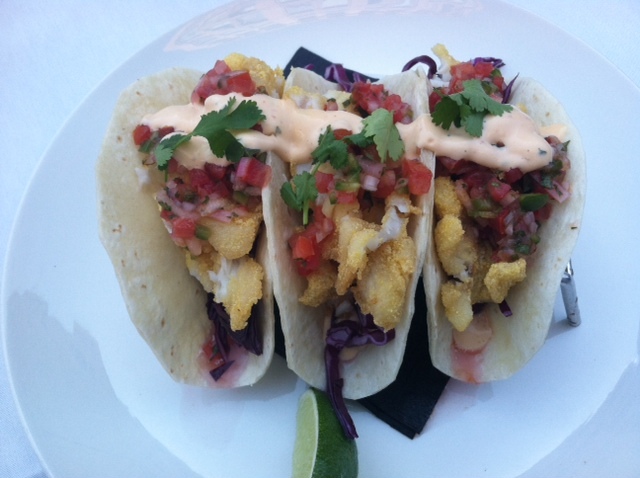 The tacos are in the Starters section and come 4 to a plate, meant to share as an appetizer. I knew I’d be picking at my mom’s parmesan fries that came with her turkey burger, so 4 fish tacos was a perfect dinner for me. The mahi-mahi was thankfully grilled (not fried like typical fish tacos) and came with a dusting of chipotle powder perhaps? There was a small kick to it but maybe that was the spicy crema. 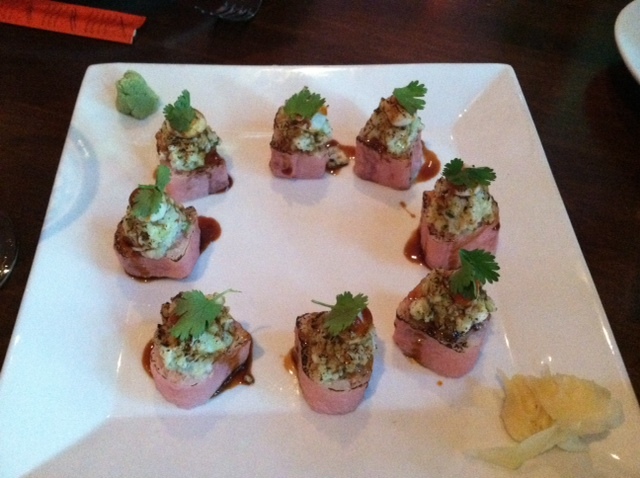 These were really great, for an app to share or as an entrée! 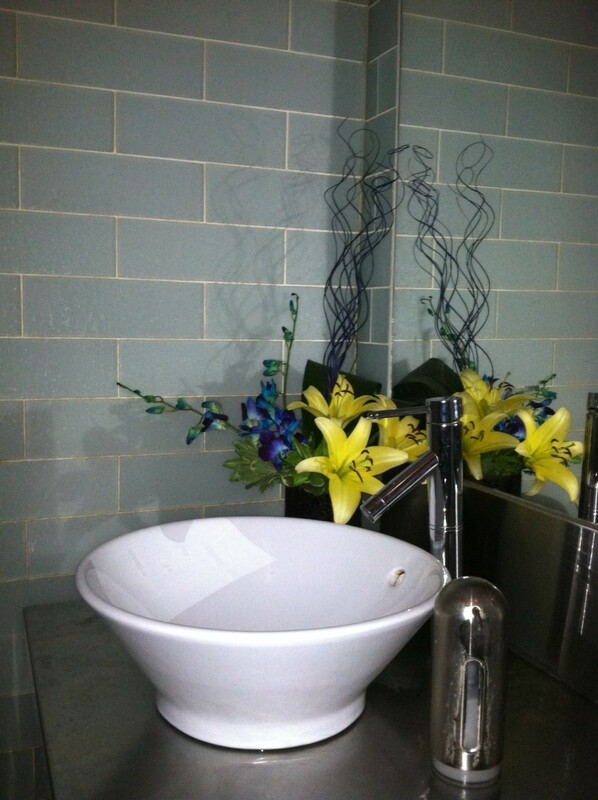 Bathroom: There are 2 unisex single rooms stalls complete with a bowl sink (which I love), a pretty flower display, and automatic hand dryers. Service: Our server was personable, friendly, and complimented my headband which automatically gives her points 🙂 She suggested the Sparkling Sangria, which my mother & I ordered a jar of, and mentioned the Mahi-Mahi Tacos were a customer favorite. I was already planning on ordering the fish tacos based on a friend’s recommendation and our server’s comment sealed the deal for me. Both of her suggestions were spot on! Overall: Cafeteria is my go-to spot on Newbury Street and one of my top 3 Back Bay favorites when looking for reasonable prices and great food. The menu is extensive with a little something for everyone. Starters, Big Salads, Sandwiches, and Burgers range from $8-$16, while Pizzas and Entrees run $11-$26. 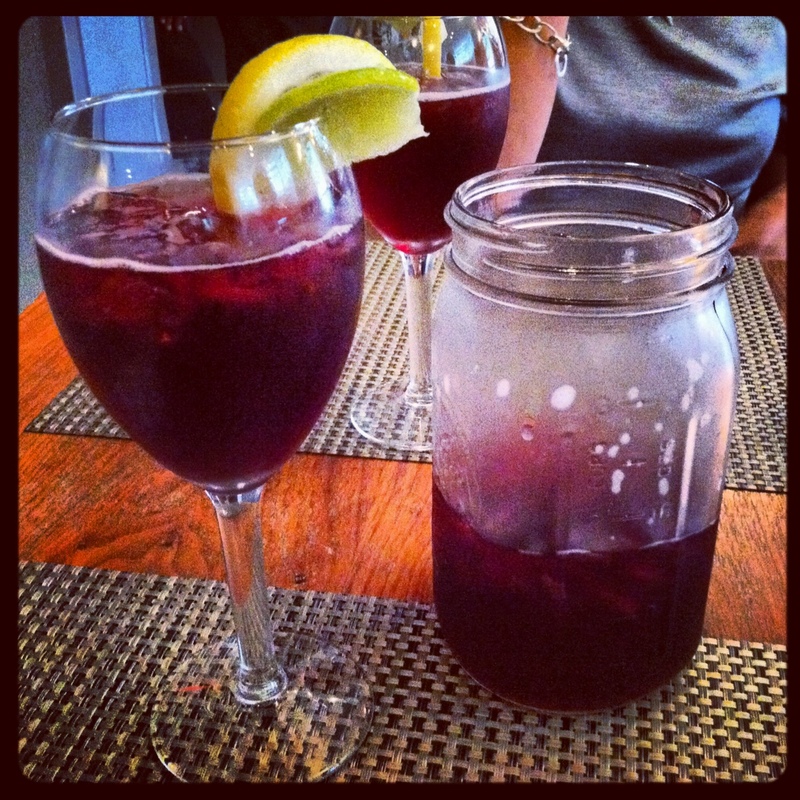 We ordered a jar of the Sparkling Sangria for $18 which held about 3-4 glasses. They have other creative cocktails and a decent wine and beer selection. The interior is at “Garden Level” which is fancy for the basement (however they have stairs that lead to a 1st floor level which I’ve never seen). This was about my 5th time at Cafeteria and I’ve never been disappointed. I highly suggest you stop by, especially while you can enjoy their patio seating. 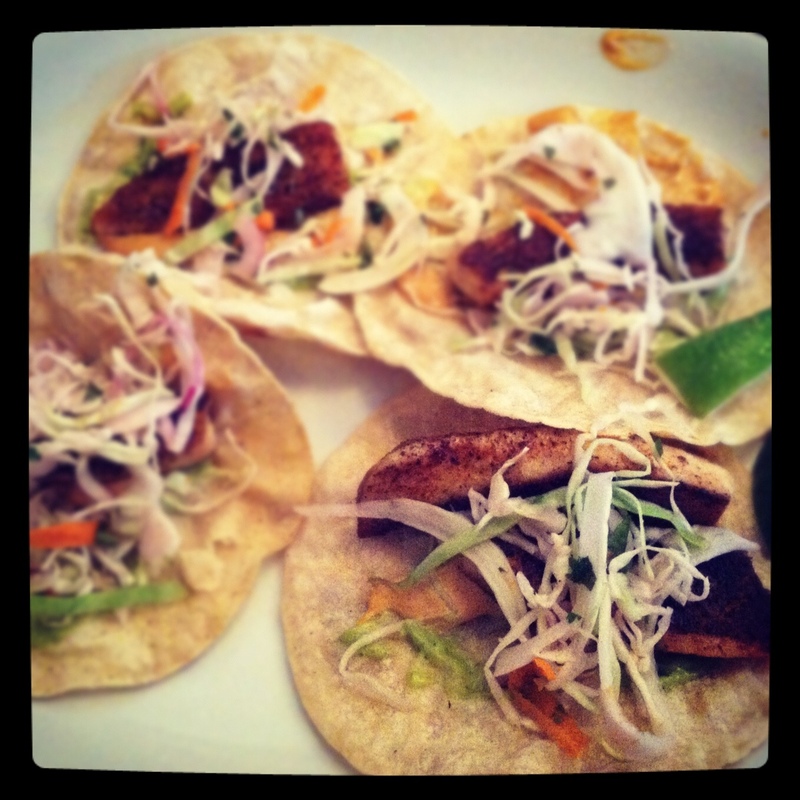 The Perfect Bite: Mahi-Mahi Tacos, spicy crema, pickled cabbage… should have added avocado! My first Restaurant Week Lunch experience! 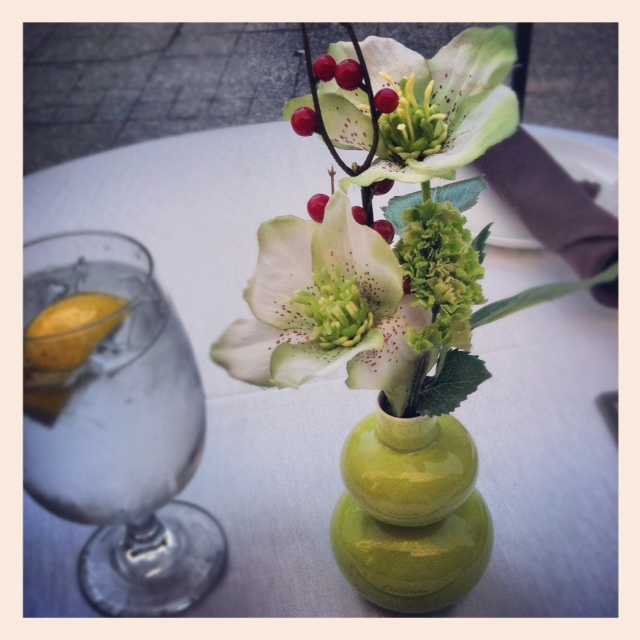 Forum was chosen because of their outdoor seating, their presence on OpenTable, and the menu looked delicious! Bread: None was served during lunch. Menu: This was my first Restaurant Week Lunch, and the menu looked excellent with 3 options in the first course, 4 in the second, and 2 for dessert. I opted for the Light Lunch for $15.12 and ordered an appetizer and entrée. Three fish tacos were served in soft tortillas in a taco holder. I guess it’s my fault for not asking, but I assumed the fish would be grilled and not fried. After getting passed that initial disappointed I did end up enjoying this course, especially the chipotle aioli, yum. Not the best fish tacos I’ve ever had but certainly not bad at all. Sounds amazing right? Well it would have been had I been in the kitchen. I’ve made a butternut squash flatbread 5 times better than this mess (granted I was following a recipe, but still). 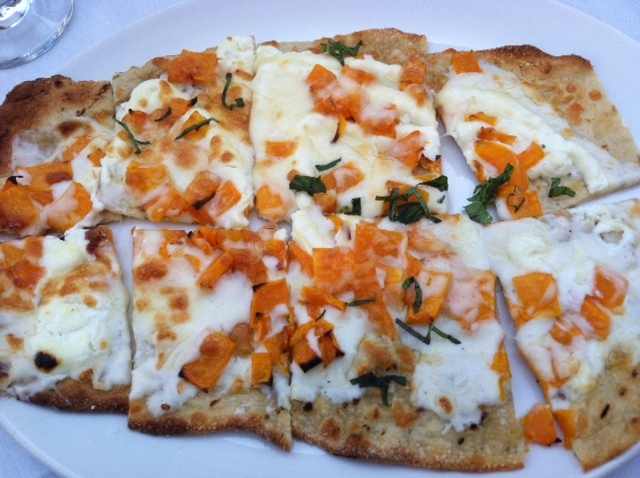 The squash seemed to be haphazardly thrown onto the dough, as was the random shreds of basil. The cheese was also a bit overwhelming; the ratio of squash to cheese was way off for me. Maybe it’s my OCD kicking in, but I like flatbreads to be even with each piece consisting of all ingredients. Sub-par 2nd course. 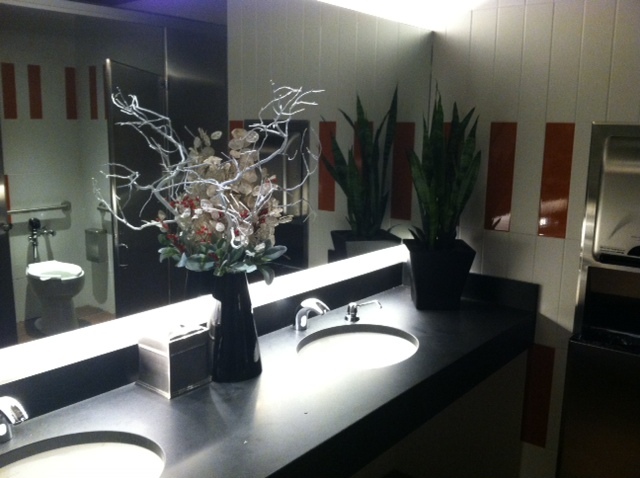 Bathroom: Really nice, with a pretty flower display (I have a thing for branches in arrangements). 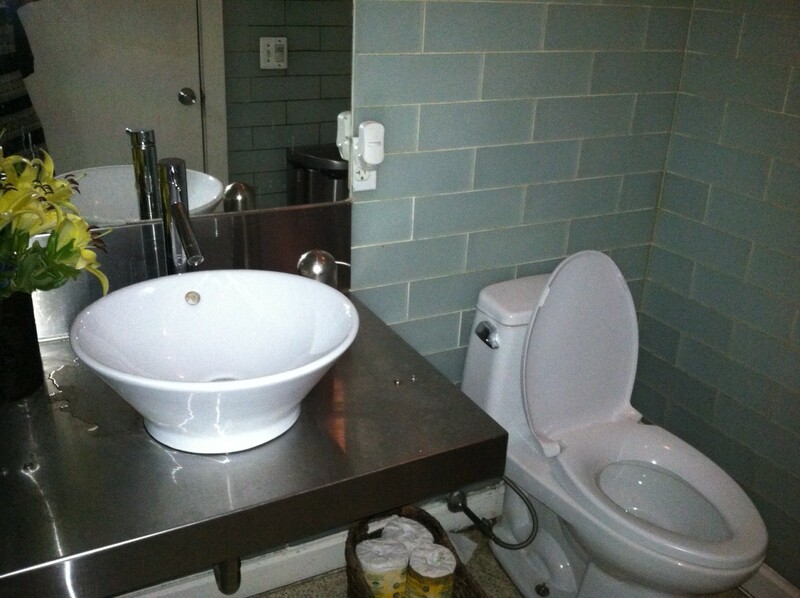 Two stalls, two sinks, large wide mirror. Service: I found myself looking around for our server every now and then, wondering where our 2nd course was, and why it was taking so long to bring the bill. Perhaps I shouldn’t be so critical; I tend to have a “hurry up and go” attitude and need to learn to relax every now & then! Overall: A bit of a disappointment overall. I’m glad I went for Restaurant Week, otherwise I wouldn’t have been happy paying the regular prices for the dishes I ordered: the fish tacos are normally $13 and the flatbread around $15. Salads and Sandwiches run $12-$16 for lunch, and dinner Pastas and Entrées range $26-$38 – kind of steep. Their menu items sound incredible, but then again so did my flatbread. 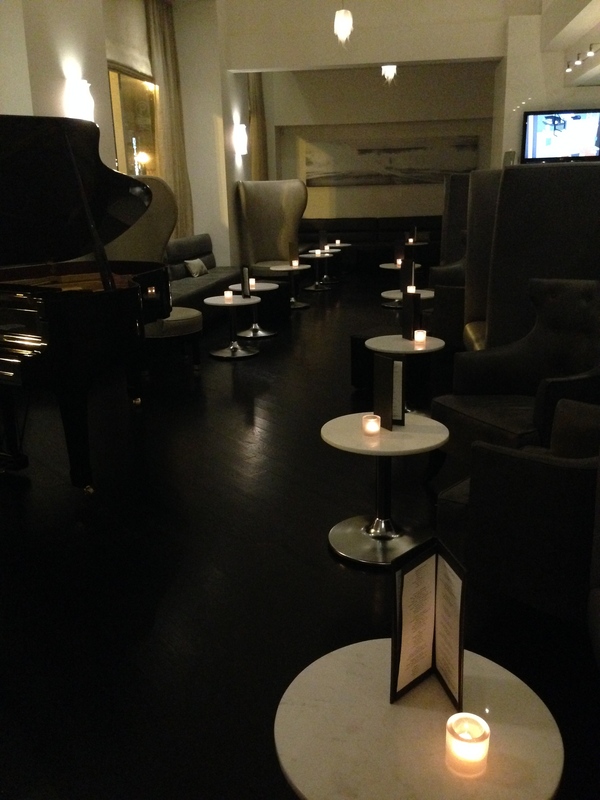 I sat outdoors but the interior had a contemporary yet elegant vibe. Cocktails are a normal city price ($10-$12) so I’d consider returning to sit at their long rectangular bar, which is equip with at least 8 TVs on either side and comfy stools. 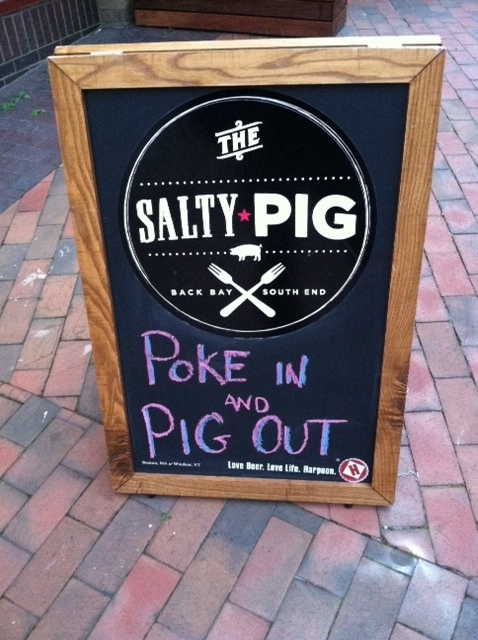 Now I’m probably the last person who would be excited to try an eatery that specialized in pig meat, but one look at the menu from The Salty Pig and I was intrigued. The sandwiches of course drew me in, as did the not-your-average pizzas (Fig Pizza: red wine fig jam, apple, goat cheese, truffle oil – are you kidding me?!). 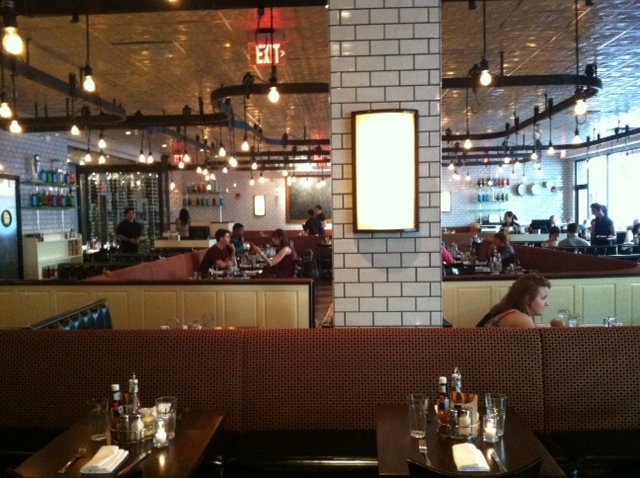 Located at 130 Dartmouth Street near Neiman Marcus in the Back Bay, The Salty Pig is a casual and hip new spot with a lot of character. Bread: Four thin slices of white bread were served wrapped in a recycled menu in a tin. 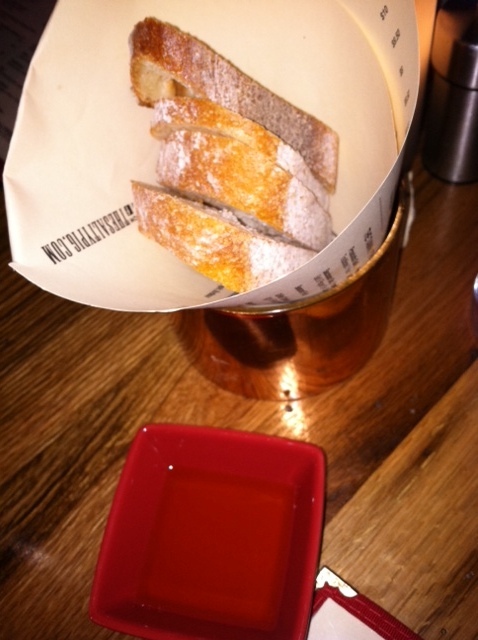 A red square dish of EVOO was brought for dipping, but I prefer butter with non-substantial bread. Menu: For a Starter you can pick your own pig part/meat, cheese and spread. They also offer salads From the Garden, Main Plates, and Pizza. The online menu shows a “Sammich” section that I was really looking forward to but apparently sandwiches are now only available during lunch. I don’t love pig meat but felt we needed to try a pairing with the cheese and spreads, so I went the safe route with prosciutto and had the waiter determine which cheese would be best. 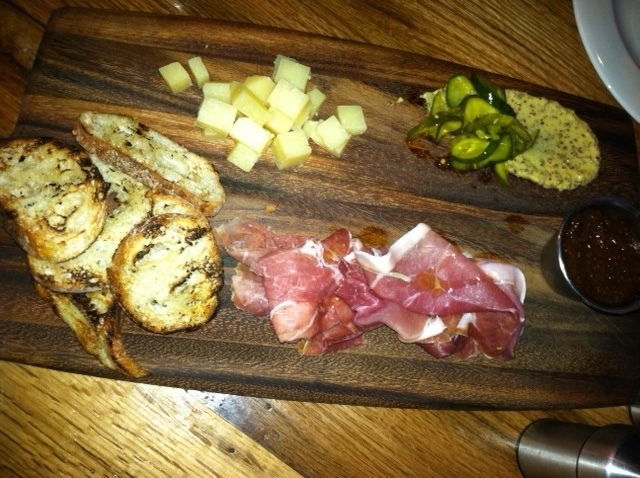 All meats/pairings are served on a wooden board with pickles, toasted crostini, and Dijon mustard. The fig jam addition was a must. I’m really glad we tried this. Maybe next time I’ll be more adventurous with the… Pork Pate? 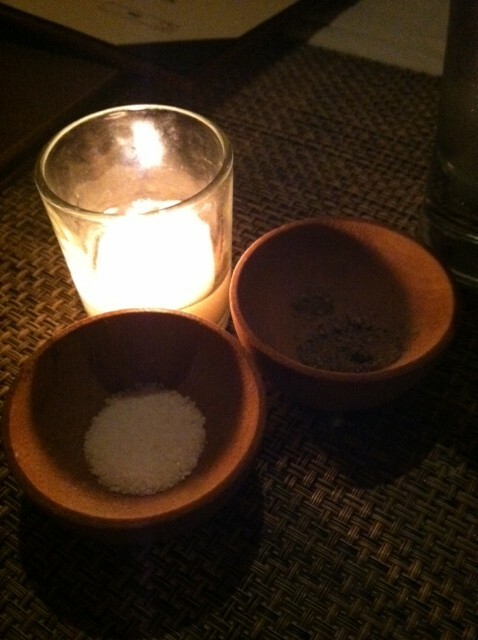 Or the Saucisson Sec (salt & pepper dry cured pork). At first glance I didn’t even give this dish a second thought, until the waiter claimed it as the best meal on the menu. I wasn’t set on another particular option so I trusted him and boy was he right! 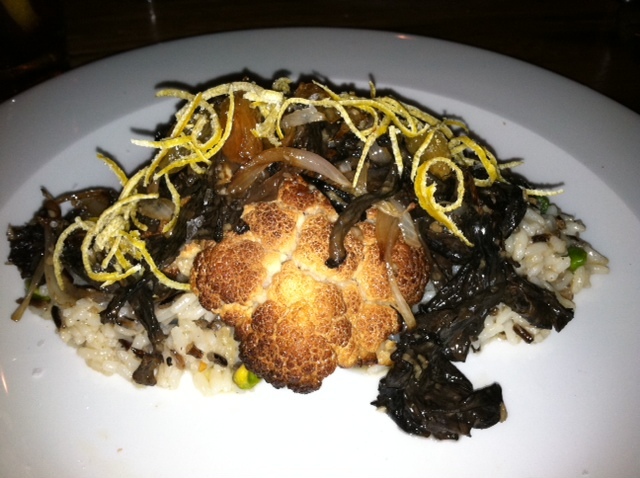 The photo may look unappetizing, but it was one of the most delicious and flavorful entrees I’ve had in a long time. Each bite had a different texture and taste; salty, sweet, smoky, creamy. Really excellent meal! 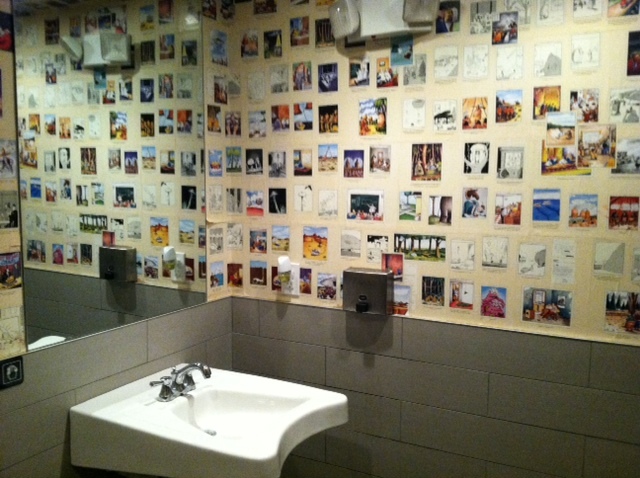 Bathroom: They have 2 unisex stalls/rooms, and the one I used had comic strip wallpaper. I guess everyone needs a little reading material when takin’ care of business! I always appreciate something different. Service: Our waiter knew what cheese to pair with our prosciutto and accurately described each entrée we had a question about. He checked on us regularly and refilled my iced-tea on cue. Overall: What a great new place! 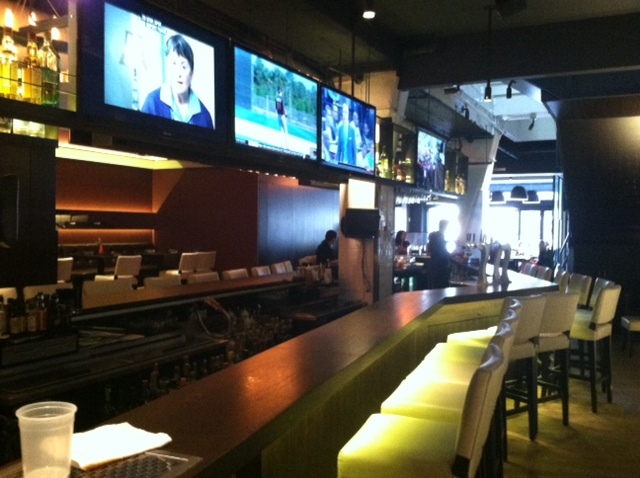 They have a few seating options with high tops, low tables, and a bar. 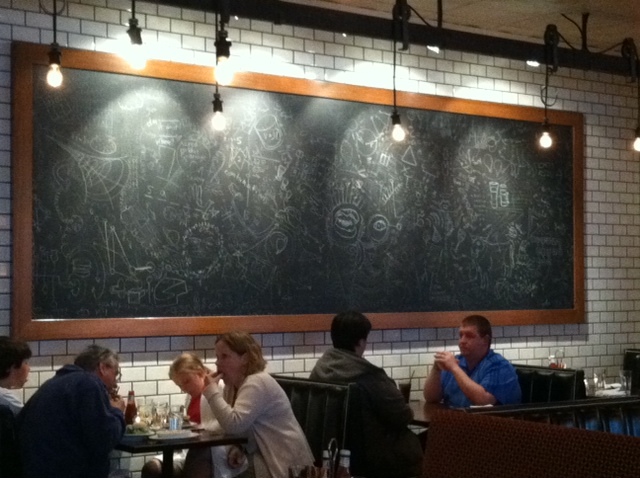 Decorated chalk board-beams lead up to high ceilings which makes this establishment feel a bit larger than it is. 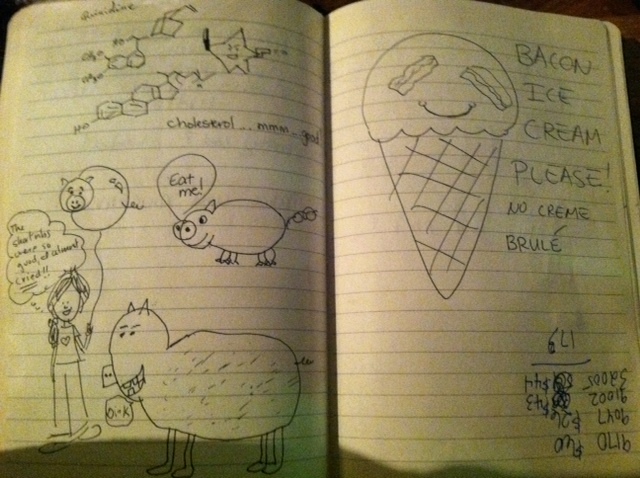 The Salty Pig has a clear voice & character; below is a customer journal/guest book that the check is presented in. I sure did let them know that I highly recommend this place! I’m 100% going back for lunch – now do I get the Chicken & Apple Panino or the Smoked Turkey & Avocado? The Perfect Bite: Each and every single bite of the smoked cauliflower dish. 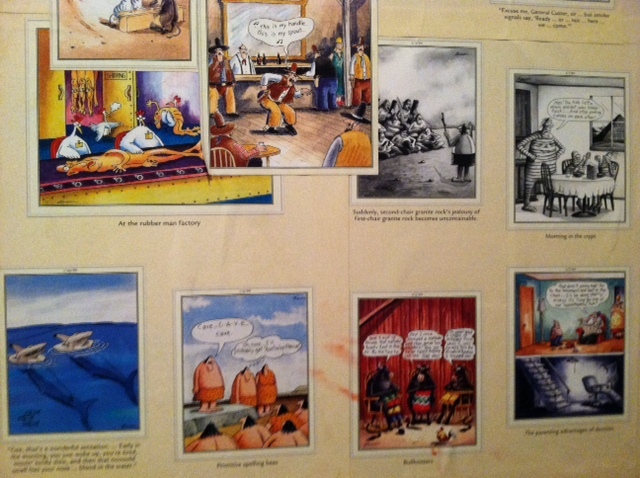 I’ve been to Via Matta once or twice before, quite some time ago. I knew it was classy and had great food but just couldn’t remember much else about it, or more importantly, what I had ordered. Thanks to Groupon/BuyWithMe/whatever coupon Erin & I purchased, we essentially received $50 off our meal which was a great start. 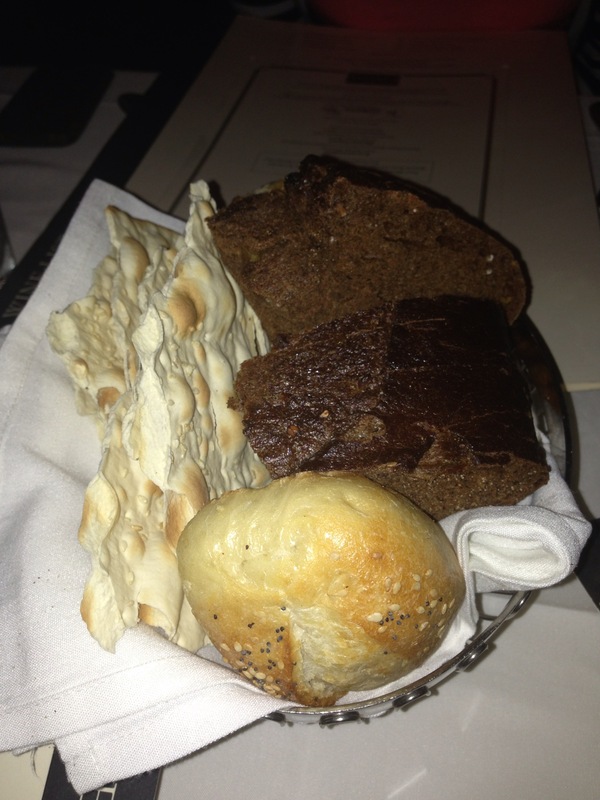 Bread: It didn’t come to our table until moments after our appetizers were served. I was starving and pretty annoyed, but the bread runner apologized repeatedly. 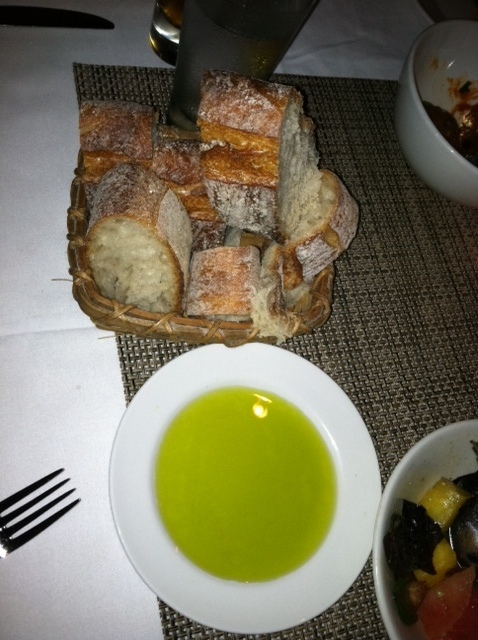 Luckily it was delicious; great, hearty, fresh bread served with a side plate of EVOO. I normally do not enjoy shrimp but there have been a couple of shrimp dishes in the past that have changed my mind, and I can now add this app to the list! The watermelon had just a bit of spice, I love avocados in/on/with anything, and basil is my favorite herb. Really tasty and refreshing. I’m really picky when it comes to meatballs since I grew up eating Gram and Dad’s homemade ones. But I have no complaints here; crispy outside, soft on the inside. At first sight it appeared perfect: massive amounts of meat with a nice tomato sauce. Don’t get me wrong, the dish was really great and I just about finished the whole damn thing, but the noodles were too soft for my liking. I prefer an al dente pasta and this seemed almost like an egg noodle. Other than that, I really did enjoy it. Service: It took way too long to get our drinks and the bread came after the apps which is a big no-no. But after actually speaking with our waitress she was really helpful when we were deciding what dishes to order. Another gentlemen helped us later in the evening when Erin asked if she could order ½ of a dessert (just the cherry gelato) to go. We had a laugh with the guy since it was a bit of an odd request. But he was hilarious and more than accommodating, and even provided her with a real spoon so she could eat it in the car! 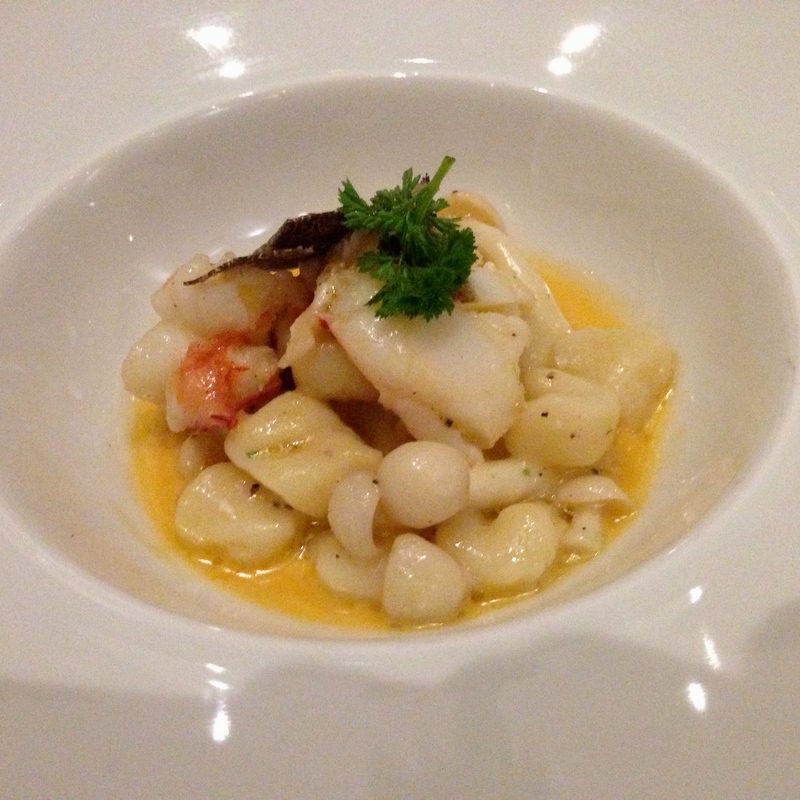 The Perfect Bite: I have honestly been dreaming of what could have been had I ordered the Agnolotti. 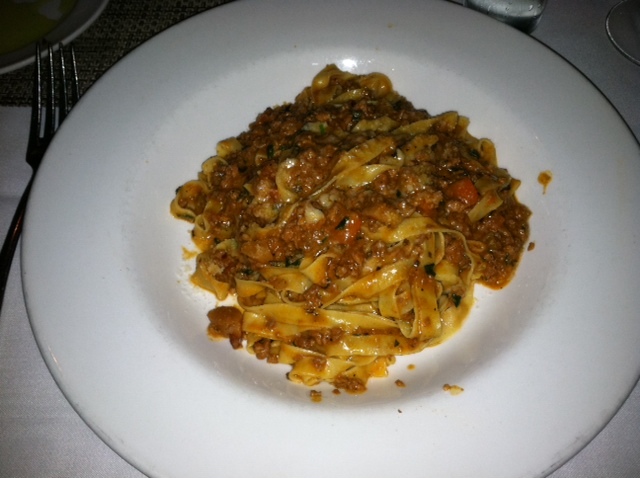 I love each and every component of that dish but the damn Bolognese won me over again. It was great, but I just wasn’t crazy about the noodle consistency. 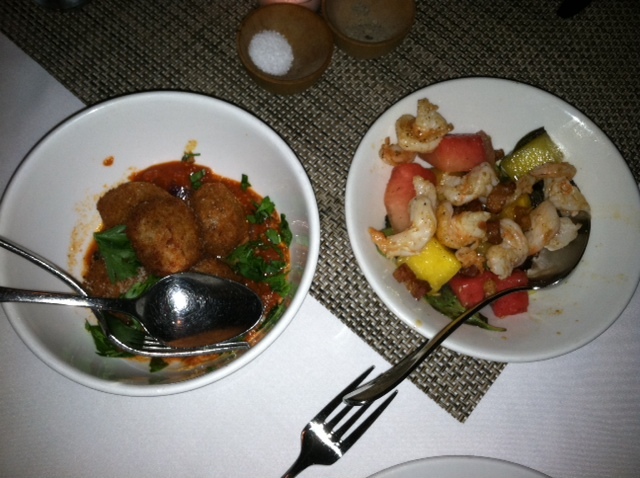 So believe it or not, I’ll go with: shrimp, spicy watermelon, avocado. 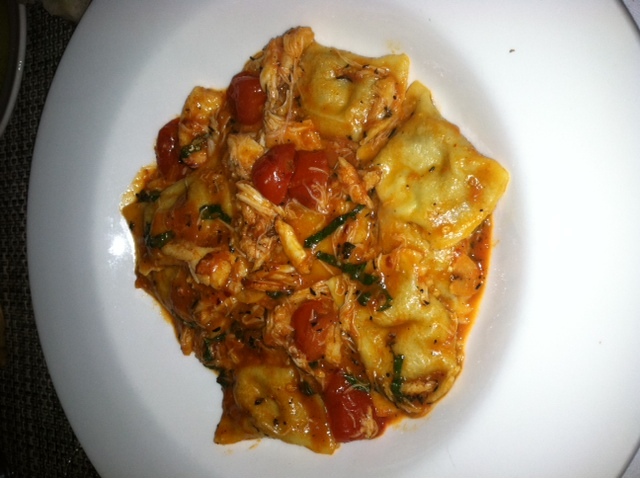 I went back to try the Agnolotti dish and oh my goodness… one of my favorite meals in all of Boston! I could have used a couple more actual pieces of Agnolotti, but the stuffed ricotta/avocado mix was smooth and creamy as can be, the crab was sprinkled throughout the dish and there was something about that tomato sauce that was unreal. Loved it! I adore burgers and haven’t been blown away by one in quite some time. I’ve been told I need to visit R.F O’Sullivan’s in Somerville as well as Mr. Bartley’s in Cambridge, but I live in Brighton and don’t cross the river too often. So thank goodness for 5 Napkin Burger, a must-eat for burger lovers, located on Huntington Ave (with access via the street and the Prudential Center). Bread: We were not served bread, which at a burger place is fine by me. I had plenty of other delicious options to fill my stomach with. Menu: Starters (ranging from soup to salads to wings to deep-fried pickles! ), Sushi Maki Rolls, Burgers, Salads, Entrees, Sides, Shakes. I had a burger mentality coming into dinner so my eyes went right to the beef. 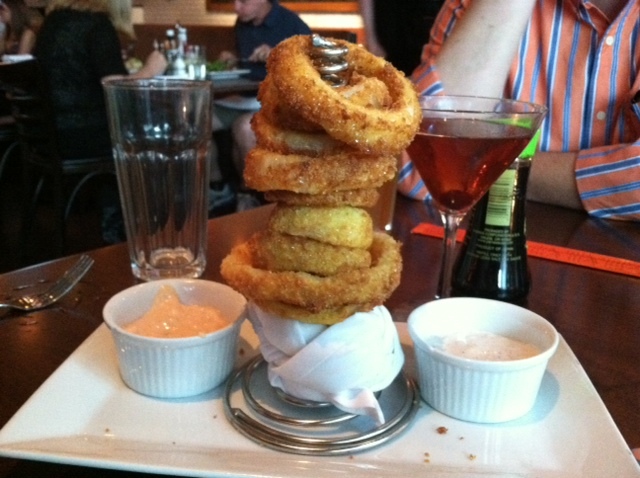 I’m not one to order onion rings (I was eating with 3 boys) but I’m glad I got to taste them! Really fantastic, especially in the 5N sauce (which I believe is a chipotle aioli). Burgers and sushi? Why not! 2 of my favorite things come together and I was very pleased. This special was excellent, so light and fresh. There are a couple other sushi options I would like to try (Southwest Roll), although it is a tad pricey, ranging from $10.95-$15.95. If they all come with 8 pieces it’s perfect to split with a friend! Simple and scrumptious. 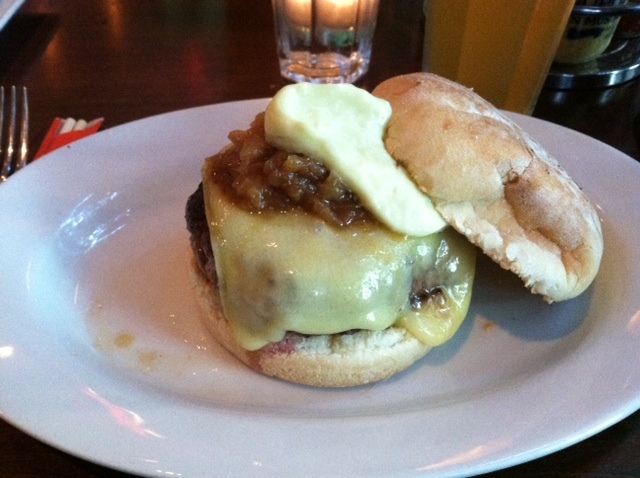 The cheese melting technique was ideal, covering the top as well as the sides of the burger. I spread a bit of the rosemary aioli on the top bun then discarded the rest (it’s really just flavored mayo, let’s be honest). We all ordered the burgers to be done differently (well done, medium, medium rare) and each came out cooked perfection. Definitely a success. 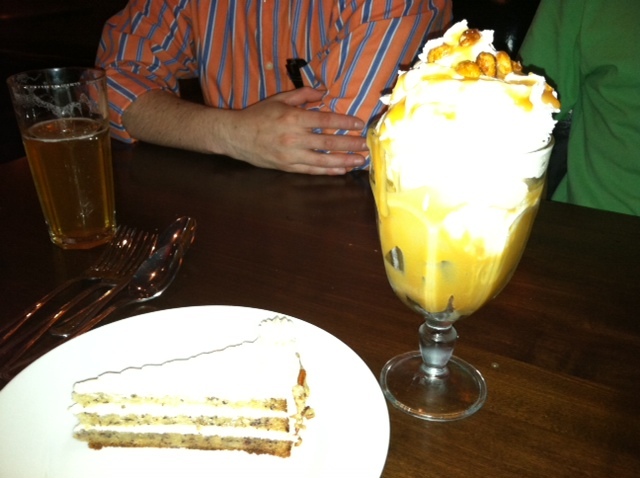 I could have had a giant bowl of the whipped cream, espresso caramel & salted peanuts and I would have been a happy girl. Vanilla ice cream is a waste of my time, and brownie sundaes aren’t my first choice, but this was really good. i deleted the good pic by accident.. This was the dessert special and I wasn’t super impressed mainly b/c it was too rich. I do love banana bread but the frosting was unnecessary for me. 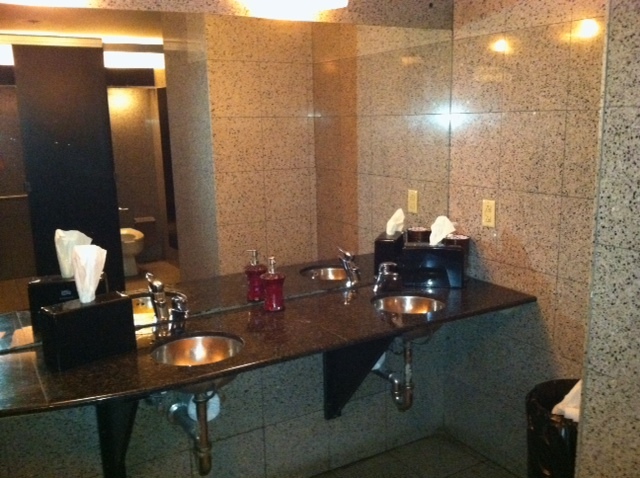 Bathroom: Spacious, sleek, clean, 5 stalls, with a full length mirror. 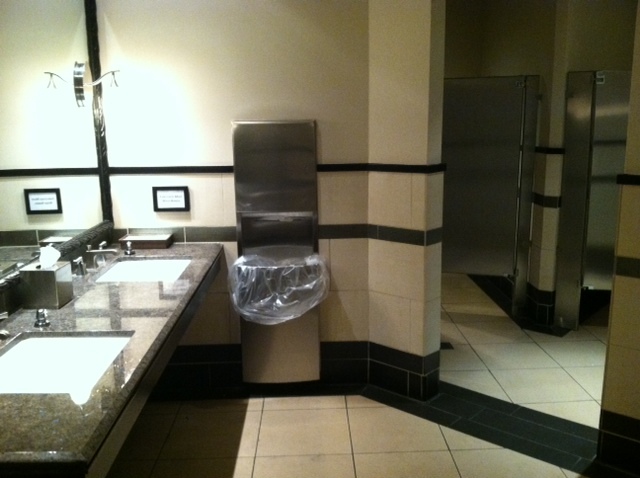 I like how the stalls were somewhat separate from the sinks. Wait Staff: I forget her name but the (single) boys were smitten. She was super cute and friendly, and totally sold us on the sushi and dessert special. She did a great job, however we ordered the sushi and onion rings as an app and our burgers were brought by food runners directly after the rings, before we even saw the sushi. Not a huge deal – we had the sushi with our burgers which actually was a nice balance – but apps should be delivered before the entrée, always. Overall: I consider myself a burger fanatic and I highly suggest 5 Napkin Burger, for burgers or sushi! Everything was honestly superb; my only issue is I wish there were more options. They have a great burger variety (beef, veggie, ‘inside out’, turkey, tuna, lamb) but I wish there were more interesting toppings, for instance: spicy mustard, avocado, relish, hummus etc. The Special Burger had a salsa topping which they should take inspiration from. The bar was spacious with enough TVs to catch a game. 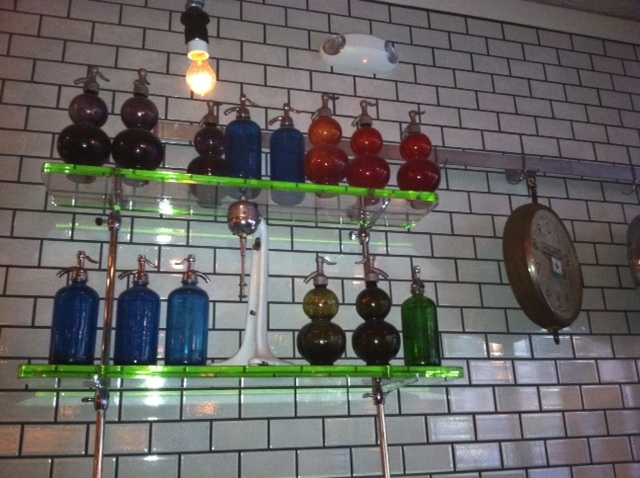 The walls were adorned with over-sized chalk boards and bottles that looked like they should hold some kind of magic potion. The Perfect Bite: 5 Napkin Burger smeared with a little bit of ketchup. The rosemary aioli was decent, but I would have preferred the 5N sauce.